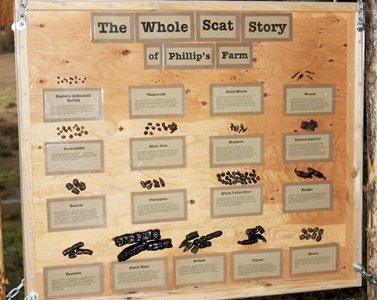 Palouse Prairie students have a long history of creating high quality work. 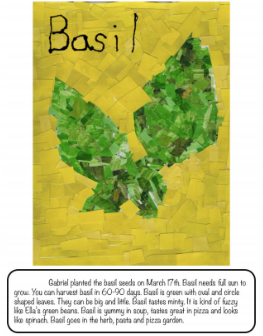 Students at all grade levels are creating high quality work that exceeds the expectations of their community. 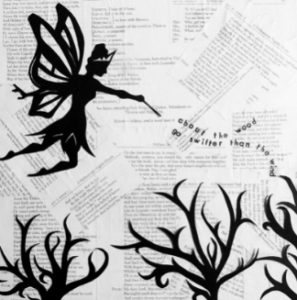 Students have produced both visually stunning work, research that is compelling, and original student thinking. Their work regularly demonstrates craftsmanship and complexity. In the past, our work has been complex as well as beautiful in conception and execution, but we strive to produce products that are utilized and recognized beyond our school community. Through the quality work protocol, teachers recognized that not all of our work was living up to its full potential in term of authenticity, both in the creation and purpose of the product. We are choosing to think about authenticity in terms of audience and the utility of our final products to the audience they serve. We are also choosing to think about authenticity in terms of the format of the product and whether the format aligns with the formats professionals use to display and convey information. 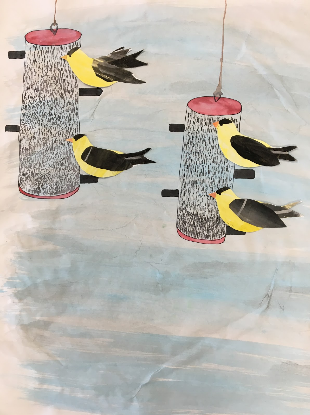 We believe Palouse Prairie’s work has maintained its rigor and beauty while becoming increasingly useful within and beyond our school community, and increasingly aligned with the formats used by professionals in the field. Audience matters. At PPCS, creating high quality products is not just a matter of creating beautiful and complex work. We want our work to have a purpose beyond ourselves. 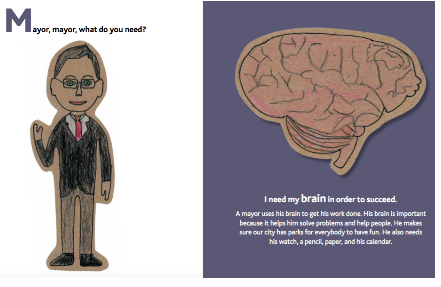 Leaders of Their Own Learning provides us with a framework to think about how we determine our audience. 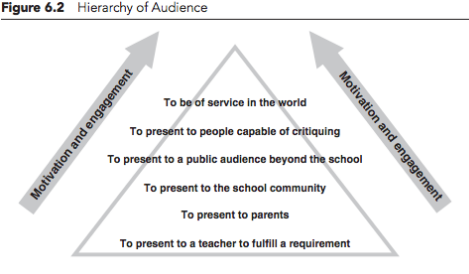 The Hierarchy of Audience helps us to increase student motivation and engagement by being thoughtful about the purpose of our work. Teachers and students have intentionally worked toward reaching a broader and more authentic audience within their expeditions. 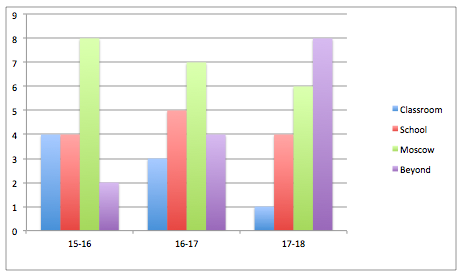 This graph shows the increase in authentic audiences for Palouse Prairie Charter School expedition final products. In the 2015-2016 school year, four final products were used solely within the classroom. The number of in-classroom products decreased to three the following year, and by this school year, only one product is used solely for classroom purposes. The school community and the Moscow community as an audience fluctuate slightly with the varying needs of the school and community. Most impressive is the student produced final products that are serving an extended and even national community. Only two products went beyond our local community in 2015-2016. This number grew to four in the 2016-2017 school year. This year, eight of our final products, nearly half, are serving authentic audiences that extend beyond our Moscow community. In addition to considering our audience, we also strive to ensure that we are using authentic formats to produce this work. Both are significant factors in producing authentic work, and both are highly valued in the development of final product plans. Our students regularly work with professionals to learn the skills to produce high quality work that matches the task in authentic ways. Students also learn how to use the revision process in in ways that professionals in the field use revision to create high quality products. 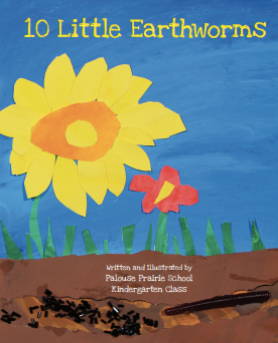 In the 2015-2016 school year only eight products used a professional format. 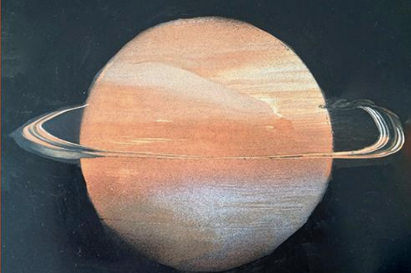 Our high quality work protocol illuminated this and we took action to collaborate with more experts specifically to produce final products that use authentic formats. 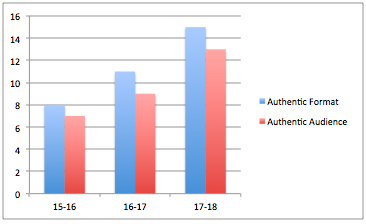 The graph above shows the increasing trend of more authenticity each year in both format and audience. 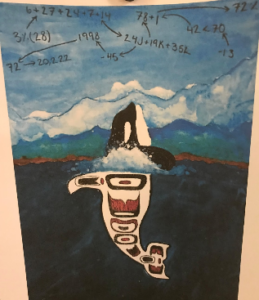 This school year, we used authentic formats to produce fifteen of our final products, representing more than 80% of the total final products produced each year at our school. While many products and expeditions have shifted in content and focus over time, there are a few which have stayed consistent over the last three years. These expedition products truly highlight our increasing authenticity, and the value of our final products to the community they are created to serve. They also serve as excellent examples to track our growth in authenticity over time. 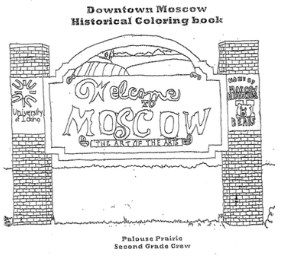 Primary students study the history of the Moscow community. The expedition begins with learning about what makes them individuals, what makes their classroom community special and what is important about communities. Students study their personal and family histories before launching into a focused study of the history of downtown Moscow, using the buildings as a lens. As 1st and 2nd grade students become historians and tell the story of how the town has grown and changed over time and they become experts on the architecture of downtown. 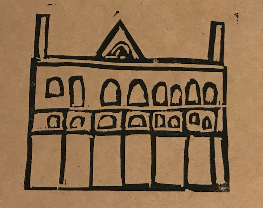 Initially, in this expedition students created a stamp with an outline of a building which was then stamped onto notecards for their families and the school community. 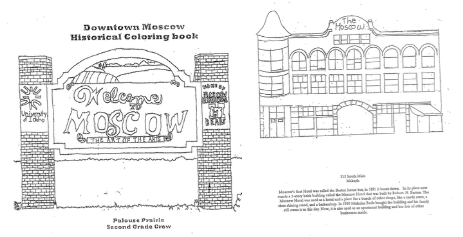 In subsequent years, a partnership with the Moscow Historical Preservation Society was developed and they supported students in learning to become historians, draw accurate architectural sketches, and tell the story of the history of Moscow. The format of this final product became more authentic, but there was still more room for growth in the audience. 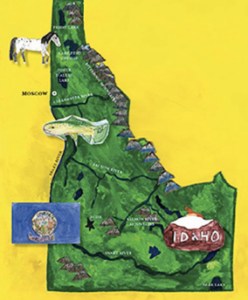 In the following year, the students still used their knowledge to draw a historical building and tell the story of that building’s history, however, they noticed the Chamber of Commerce needed a more accurate map of downtown and more accessible information. 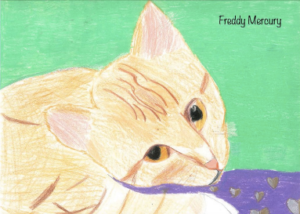 Students’ work was featured in a coloring book to be distributed by the Chamber of Commerce as well as used by the Latah County Historical Society for walking tours. Examples of the stamped buildings and map created in 2012. Examples of the first round of architectural drawings created in 2015. 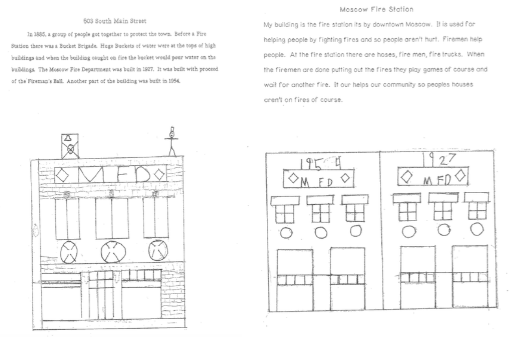 This is the cover of the coloring book and an example of a building from 2017. 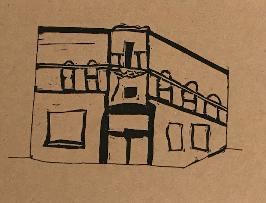 The growth in the detail of the McConnell building from the stamped example in 2012 to the current architectural drawings is noticeable. 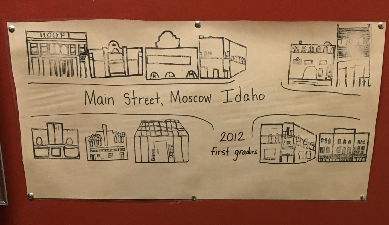 With the help of local historians and architects, our students were able to use a more appropriate format- technical drawing- to capture the historic facades of many of Moscow’s buildings. 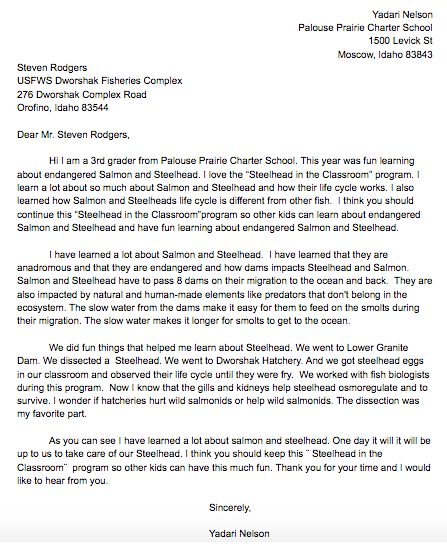 In 3rd grade, the Call of the Wild expedition explores how natural and human-made elements impact local ecosystems. 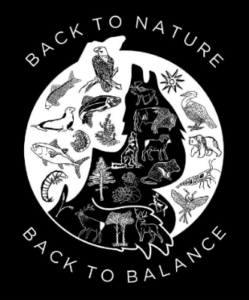 The case studies narrow the focus to species that have been listed on the Endangered Species List and local conservation issues, namely wolves and their reintroduction into Yellowstone National Park and Salmon/Steelhead’s migration through the Columbia River Dam system. The final product has always had two components. 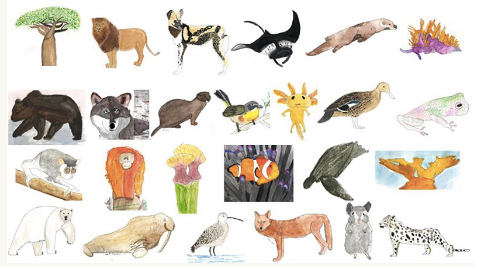 First, the students learn how to use scratch art to create realistic images of salmon, wolves or other species also belonging to the same ecosystems. 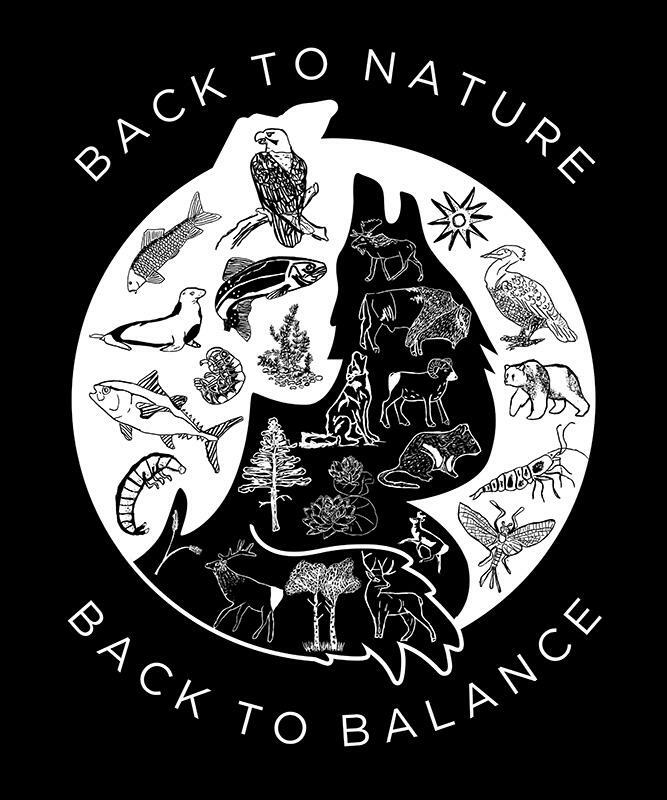 These images are compiled into a design that represents the learning and a message of awareness for the natural world, then put onto T-shirts to be sold to and worn by people in our community. 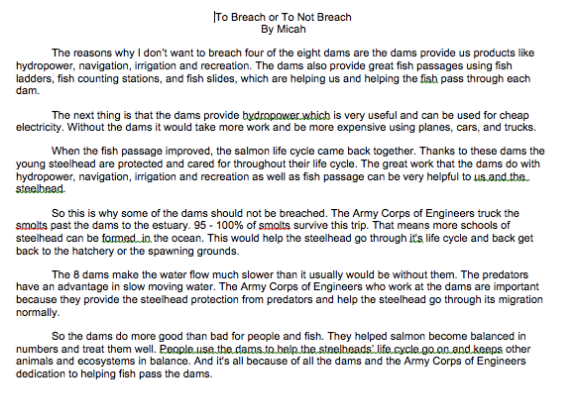 Then, each student’s perspective on the issues studied is captured in a writing piece. These writing pieces have included letters to invested agencies to share perspective, ask questions and make a call-to-action. In previous years, these letters have required students to synthesize their learning and take a stand on an issue, but haven’t met an authentic need or had an authentic audience. The Frederick Douglass final product has grown in authenticity over the years. 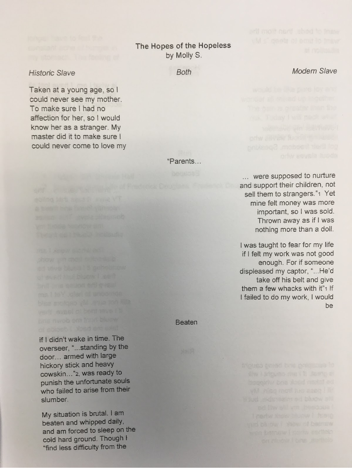 The first year of the expedition, students wrote two voice poems sharing the perspectives of modern and historically enslaved individuals. They sent these poems, along with letters, to modern day abolitionists to show support and understanding of their work. Over the last two years, the final products have been determined directly by The Frederick Douglass Family Initiatives based on program and organizational needs. They are different every year in order to be responsive to the needs of the organization. 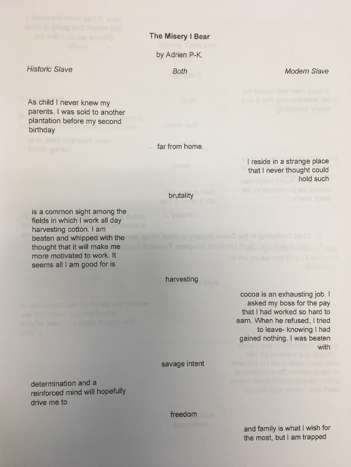 In previous years, students made social media videos to support their One Million Abolitionists Project and this past year students wrote biographies of individuals receiving F.D. 200 Awards (a project FDFI launched in collaboration with American University that will roll out nationally in June). 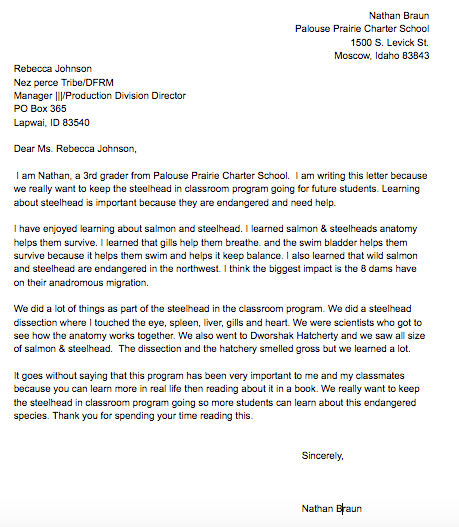 In conclusion, Palouse Prairie students have been able to grow in their ability to create high quality work. Through an intentional focus on increasing authenticity, students work has continued to get better and better while meeting needs that reach beyond our school community.